Well, can you believe Christmas and the New Year have been and gone! You seem to spend a long time planning Christmas and then you blink and it is over. I hope you all had great productive holidays and are feeling great and ready for the New Year. My first link for this week is to another great GTD and SpringPad post. This post was written after seeing the post I wrote about last time. I still have not fully examined SpringPad but it is on my list to look at as soon as I can in the New year. My second link is to a great post from the Google SEO Master, Matt Cutts about How to Start the New Year with a Blank Inbox. This is aimed towards GMail users but it is still a great blog post from Matt Cutts. My third link is to a post about Getting Things Done from the Brain of Shawn blog. Great to read the way the author is motivated into Getting Things Done in his own way. My fourth link is a link to a question that was posed on LifeHacker called How Do You Get Things Done on an Airplane?. Now the juicy content is in the comments rather than the post which just serves as a question. Some great ideas of how people utilize this otherwise wasted time. My fifth and last link is to a post from Gordo Byrn about Applying Your Personal Plan. This is an interesting and intelligent post that is well worth the time investment. This entry was posted in Email Productivity, General Items, GTD and Productivity Links, GTD General and tagged Gmail, Google Mail, gtd, Productivity Links, Springpad on January 2, 2011 by Andrew Mason. This is the last weekly post before Christmas! Cannot believe it has come around so quick. Nearly got all my shopping done. Just a few last minute gifts to get tomorrow from the shops so lets see what happens! My first link for this week is to a great post from Dan Gold about how he uses Springpad and Evernote to Get Things Done. I love Evernote and I have SpringPad but must admit I need to use it more and I just might after seeing this post! My second link is to a great post from the Evernote Blog about Making the transition from Delicious to Evernote. Yahoo announced they may be closing the door on Delicious so now is the time to start migrating your bookmarks away. This post shows you how you can achieve this with Evernote. My third link is to a post about how to turn email into OmniFocus actions. This is from the official OmniFocus forums and covers a recent release of OmniFocus. My fourth link is a link to a great collection of the Top 5 OmniFocus Applescripts. If you use OmniFocus as I do, then these are a must so check the post out. My fifth and last link is to a nice little post about Blending Pomodoro and GTD. Nice little post that looks at how you can take the best parts of each methodology to blend them together into something cool. This entry was posted in General Items, GTD and Productivity Links, GTD General, iPhone Productivity and tagged evernote, gtd, omnifocus, Productivity Links, Springpad on December 19, 2010 by Andrew Mason. A couple of weeks ago I blogged about a new productivity application called Springpad. Springpad is one of the more interesting attempts at organization currently available from designers who wish to provide a fresh take on productivity software. Although it is probably best taken as a single part of a total organizational plan the system is nonetheless a very impressive program which can go a long way toward providing users with a forum for keeping their thoughts and lists in one attractive and detailed place. The software is exceptional and provides easy access coupled with pleasant visuals. Springpad’s designers have obviously spent a significant amount of time ensuring that their organizational method is both functional and graphically impressive. Navigation of various Springpads and their editing or maintenance features is very well established and easy to pick up and get used to using while the aesthetics are all extremely clean and colorful, proving conducive to the experience rather than acting as an unnecessary level of eye-candy. Design elements such as lots of open space and simple icons work together to create a beautiful home for daily list creation and editing. Due attention should be paid to the unique Springpad system that has been developed here. The programmers have created their very own nomenclature and sorting method through their ‘springpads’— essentially any number of organizational pages and sections for users to customize. The developers have created a substantial number of Springpads with templates for popular organization projects (holiday shopping, grocery lists, weekly chores, medical check-ups and prescriptions, etc.) so users can easily pick a well-established outline for common work. Aside from this, it is quite easy to learn how to make your own, specially tailored and completely personalized Springpads from the tools provided. As mentioned before, Springpad is probably best taken as one aspect of a larger GTD (or other) productivity plan. Even from within this light the program still offers a fantastic option for any individual’s organizational system. GTD devotees will most likely get the best mileage out of using Springpad as a temporary holding place for their short-term actions. Springpads are great places to keep next actions or tasks which may have many different facets but still require completion within a small time-frame. They can also be shared among other users or re-used when the situation calls for repeat access (like in daily or weekly actions such as meal preparation or regular work tasks). Lastly it should be noted that each Springpad can have online features added in to enhance their usefulness. Through the addition of maps, location-based favorites (such as restaurants, hotels and more) or e-events, users can easily improve the functionality of every one of their lists and pages. Springpad does a good job of keeping its users up to date on all company news, job listings and community information through their homepage. Tutorials and in-depth guides to the system abound which help to ensure that even novices will have a painless process getting used to creating and editing their own Springpads. The hosted blog also helps in keeping all application updates and information in one place as well. Users who try out Springpad are sure to be happy with at least some aspect of the program given the detail present in each organizational option intended by the developers. Although it may ultimately prove to be a bit shallow on the whole for those who want a single resource for all of their productivity tasks, Springpad should still be commended for its inventive take on GTD software and organizational software in general. Do you use Springpad?, If so, I would love to hear your thoughts on the application. This entry was posted in Cool Software, General Items, GTD Application Reviews, GTD Applications, GTD General and tagged gtd, productivity, Springpad, tasks on December 4, 2008 by Andrew Mason. I have just come across Springpad via a Google Alert and thought I would share it all with you. 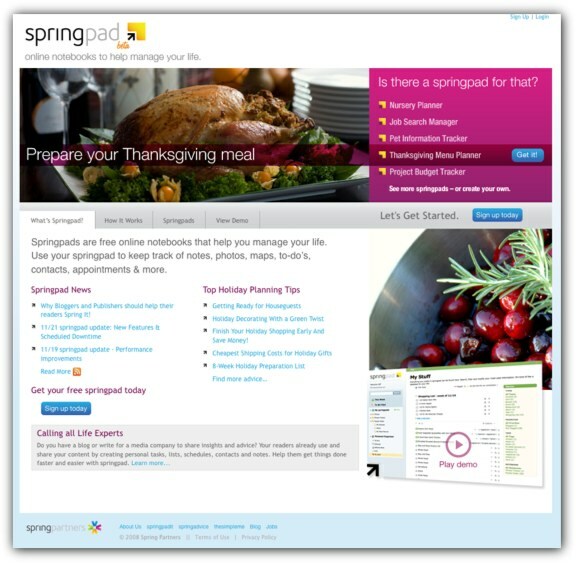 Springpad is a web-based life organizer that is based on free online notebooks, called Springpads. There are Springpads for most items from a Moving Checklist right through to a Daily Diary. There is even a GTD Notebook Springpad which allows you to organize your tasks in a system based on the Getting Things Done methodology from David Allen. Check out the welcome video below from Springpad. This does seems like a different approach from the normal web based organizers and one that I feel needs a more in-depth look before I make my mind up as to the value of the application. I have registered for an account and I have added it to my review list so expect to see an in-depth review coming soon. have you tried Springpad? I would love to know what you thought about it. This entry was posted in Cool Software, General Items, GTD Applications, GTD General and tagged gtd, Springpad, tasks on November 19, 2008 by Andrew Mason.